There is nothing better than having your own chickens for fresh eggs – well no, nothing better than your best friend having chickens. Once you have been treated to beautiful farm fresh eggs you quickly realize they are so superior to anything offered in the grocery store. This recipes is a massive egg scramble somewhere between a frittata and a quiche but easier than both. I used Spanish Chorizo which is smoked and precooked so if you substitute a raw sausage, increase the cooking time for sautéing. Cut the scramble into wedges and served with a simple green salad and crusty bread for a fabulous casual dinner. Wisk the eggs and the salt and pepper in a big bowl and set aside. Heat an oven safe sauté pan or skillet to medium high heat and add the butter and the onions. Sauté until the onions are lightly brown about 7-10 minutes. Add the Chorizo and sauté until lightly brown 1-3 minutes. Add the tomatoes and stir until they are softened 1-3 minutes. Evenly distribute the ingredients in the sauté pan, add the herb mix and reduce the heat to medium heat. Pour the eggs slowly over the mixture. Move the pan back and forth so a crust begins to form on the edges – in about 2-3 minutes the eggs will start to set. Sprinkle the egg mixture with the cheese and place under the broiler for about one to two minutes or when the cheese is melted and the eggs are almost fully set. 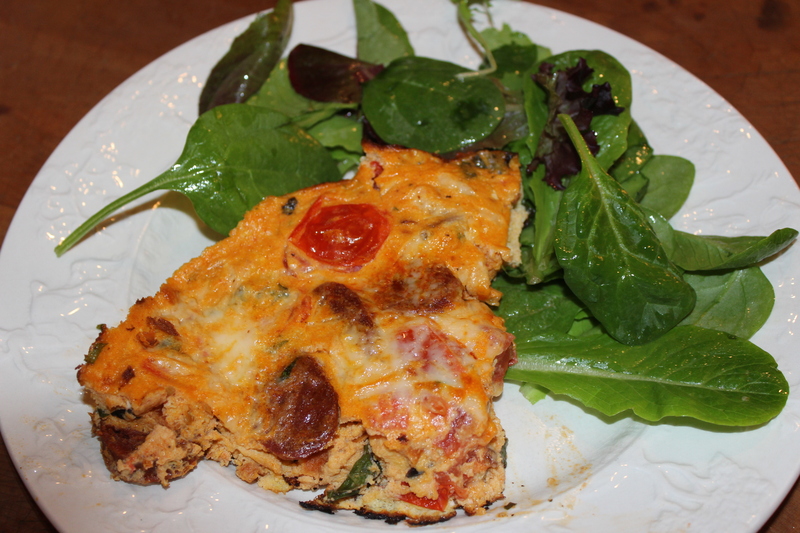 This entry was posted in Recipes and tagged Breakfast, Chorizo, Dinner, Eggs, Gluten-Free, Tomatoes. Bookmark the permalink.